Tattoo is increasingly becoming popular among teenagers and young adults in the US. If you want one, you have to simply go to a tattoo parlor and consult your ideas to an artist. But if you are really serious about tattooing, then you may be having thoughts about owning a tattoo machine and practice it in the long run. No wonder you’re reading this article because you have the same intention at the back of your head. So, what you really need to know about tattooing is that you must have the right tattoo machine that you can feel comfortable with. This way, you will surely enjoy this line of interest more than ever. Here’s a guide to start. It’s a hand-held device that tattooists use to “paint” images into one’s skin. But before you begin tattooing you must gain a better understanding of its parts and how it works. A tattoo machine, also known as tattoo gun, is composed of conductive metals such as a pair of coils and springs, a tube vise, a grip, screws, a frame base and a needle holder. 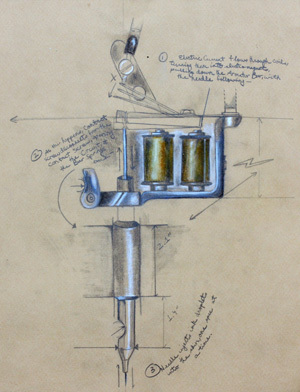 Modern tattoo machines run on alternating current produced by coils and a capacitor. The electromagnetic coils are the first components to produce this alternating current. The current is set to be received by the capacitor which will then produce another charged current to make the two springs of the machine work. These springs, which are mounted on the frame base, will use the right amount of current to push the needle(s) into the skin of your body. The rear part of the tattoo machine is where the contact screw can be found. This is where you will hold the machine using your hand. Meanwhile, on the front end is where the needle is placed and going in the inside is where you can find the grip (a tube-shaped metal) that is linked to metallic frame thru the tube vise. Keep also in mind that there the sizes of the need holder and the needles itself may vary depending upon the tattoo size, design and type to be had. 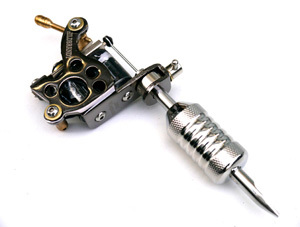 Choosing a particular type of tattoo gun is a struggle commonly experienced by the buyers. It is simply because there are lots of them available on the market today. And while each type may have its own pros and cons, the last say will still depend on you so you have to make a decision carefully. However, bear in mind that these machines are not limited to the above mentioned classifications. There may be other variants available out there, so keep your options open. But how do you keep your options open if you don’t have a strong grasp of consumer buying decision? 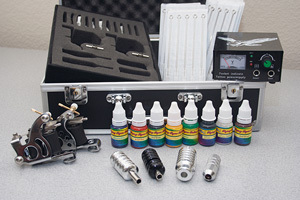 When it comes to purchasing tattoo guns, several factors should be given a thought. Likewise to regular shoppers you will need a checklist featuring your desired preferences in a machine. Also, take note of the particular laws that may have restrictions in regard to owning one or the materials that cannot be purchased or shipped to your location. Whether if it is brand new, second hand, or refurbished you certainly do not want your unit with damaged components. You should settle for machines that are in good condition despite of its price being higher than the others. By saying in good condition, it must be capable of performing the tasks in the safest way possible. This is why tattoo artists strongly recommend people to have a close examine of the machine you’re planning to buy. You must visit a physical store in order to see it in actuality, especially if you want a handmade machine. As for the cost, you can get enough savings with second hand tattoo machines. Just make sure that all parts are still in mint condition, clean and safe to use. Aside from this, the quality in the results delivered using the second hand machine should still be noticeable. Much like shopping at the mall, buying online also involves a little bit of shopping around, research and communication with the seller. The best thing about this mode of shopping is that you don’t have to go back and forth to a physical store. More importantly, you can buy a tattoo machine that is available in other states or countries which makes it quite impossible for you to reach immediately. Find a reliable supplier online. How can you tell? Read their client testimonials or product reviews. You should also not miss the opportunity to use the seller’s support. This way, you can easily get answers to your questions. A reliable supplier will also provide complete and detailed information about the product. This includes the shipping weight, shipping days, power supply requirements, accessories, available colors, sizes and styles. It’s not bad to ask around anyway. Take advantage of all the resources available online. Lastly, choose a web store that offers money-back guarantee and 30-day return if you are not satisfied with the product you bought. Or at least, they should offer reasonable warranty coverage. When you buy online, it is understandable to feel some doubts about the authenticity of the machine you’re looking at. But how do you really spot a fake one? It has been established by the professionals that the only fake ones are the homemade machines, and of all types, it’s the rotary tattoo machine that gets duplicated easily. It can be homemade just like how people in the prison do it. These homemade machines are made by people who have little knowledge of real tattooing. The fake ones are commonly constructed with low-voltage motor that you usually see in toy cars. The motors are connected to whatever handle that can help you put the ink into the skin like a toothbrush or a pen. What’s worse is that the needles are substituted with paper clips with a sewing needle attached to it. As you can see in the picture, it’s easy to spot a fake tattoo machine. Be wary of this kind though as they do nothing but cause skin trauma and irritation. Your shopping around does not end with buying that machine fully. But it should continue with conducting regular maintenance on the item by getting all the supplies that you need. These supplies include the ink, power, needles, tubes, and first aid kit. Additionally, most tattoo artists have a foot switch, electrical supply and a couple of tattoo guns in their kits. The needles push the ink into your skin once it gets contact with it. It may come in different sizes, too, so make sure that you have a wide variety of needles to be able to accommodate as many customers as possible. The tattoo tubes hold the needle in exact place. This supports the needle as it comes in contact with your skin. Therefore, both of these small items are a vital component of tattooing. You can actually buy tubes and needles in either reusable or disposable condition. Of course, if you opted to buy a reusable needle and tube, you must make sure to clean and sterilize it regularly. You can clean it using an autoclave. Just make sure that you will clean the needles and tubes in between your tattoo sessions with different customers. Tattoo artists combine ink with a certain metal content. It is also combined with the so-called carrier liquid such as alcohol or water, to engage the color from the tattoo machine to the skin. You can mix your own colors to save money or buy the pre-mixed ones at the stores. But most tattoo artists nowadays prefer to mix their own ink colors so they can experiment with their craft. Besides, the FDA regulates the distribution of such a product to protect the well-being of the customers. As a result, you may arrive at some point where you have to improvise your own palette just to meet the necessary design requirements. An extra tattoo power supply can guarantee continuous tattooing, especially if you are to ink a customer over long periods of time. This machine supplies you with power that is necessary to run your tattoo machine properly. Power supplies are available with analog or digital displays, showing the current power load and foot pedal status. This way, you can easily adjust the machine according to your desired speed. However, your power supply kit’s features and voltage should complement the type of your tattoo machine and tattoo art specialization. No question about why you must buy a first aid kit. You will never know what kind of emergency cases may arise anytime. Therefore, be prepared to respond to it with the help of your medical supply kit. Take the other medical supplies such as sanitizers, furniture disinfectants, and other cleaning tools into consideration. You must maintain a hygienic and sterilized work station to protect the health and safety of your visitors and customers. By now, you should have an idea on where to begin with your first tattoo machine purchase. As always, do your research, shop around and hold a close inspection of the item before closing the deal with the supplier. When buying online, don’t miss out on the latest product reviews supplied by the previous customers and review sites. Read the money back guarantee terms and conditions to know if buying the machine online will be worth it. Make sure that you have received training and education about all-things tattooing, because only then you will know what type of machine you really want.